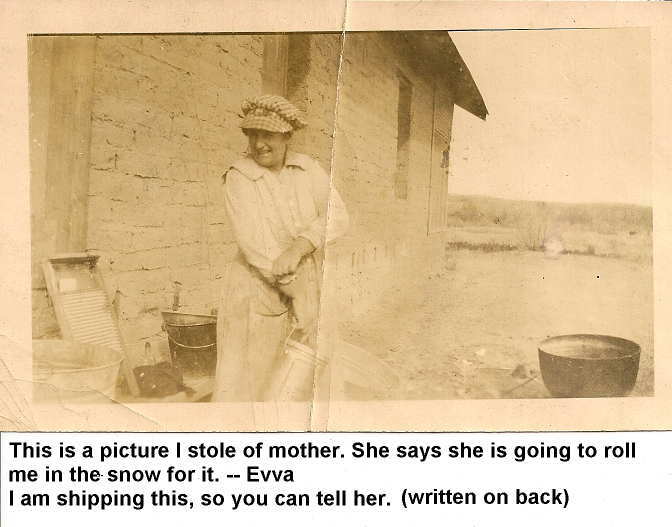 This week I transcribe a 1920 news story from the St. Louis Post Dispatch which mentions Dave Cruvant, the brother of my great grandmother, Bertha (Cruvant) Newmark. While I have shared these before on this blog, below are some greeting postcards from the 1930s...a few of them a bit risque...from my maternal grandmother's collection. Blatt as a Jewish surname comes from the Yiddish word Blat, meaning 'Leaf.' My ancestor, Jacob Blatt, came from the town of Łosice, Poland. I may know the names of several of Jacob's siblings, and their father, if some research I've been given is correct. Family notes handed down directly from Morris's daughters says his first wife was named Belle Wyman, and she died in Poland about 1892. One of Morris's daughter's, Blanche, married a Wyman, and it was a family joke whether or not she married a cousin. However, research has found a Morris, son of Jacob Blatyta in Losice, who married a Chaia Beila Boksern. It's thought that Belle had a first husband before Morris, so that could explain the surname confusion. Her maiden name could have been Wyman, and her first husband's name could have been Boksern. 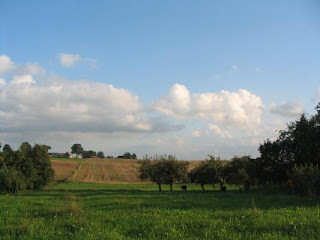 Without evidence of Chaia Beila's first marriage, or birth records of Blanche and Anna indicating their mother's name, or some other documentation, I am left wondering whether there could have been two Jacob Blatts in the Łosice area, with a son named Morris. So below I start with Jacob until further evidence confirms the connection to the Blatyta family. The numbering below follows the d'Aboville system. __s indicate a living relative. I'm looking forward to the opening episode on January 21. I may end up DVRing it, though, since it is my birthday. Update: NBC's announcment adds Gwyneth Paltrow to the list, who the other sources didn't name, so I have added her name above. Also...the premiere seems to have been pushed back to February 4th. So it's no longer a birthday present for me, but maybe I am less likely to be busy during the premiere. Family Tree Magazine has opened voting for their second annual round of the 40 Best Genealogy Blogs as chosen by the Genealogy Community. This blog has been honored with a nomination in the "My Family History" category. You can vote here, and have through Monday December 20th to cast your ballot(s). The Cruvant surname originated in Lithuania, likely named from the town Krūvandai. The family has been traced back to Čekiškė, which is only 5 km north of Krūvandai. Over the past two centuries, different branches of the family have chosen different phonetic spellings, the five most common are listed above. My second great grandfather, Moshe Leyb Cruvant, appears to be the originator of the 'Cruvant' spelling. 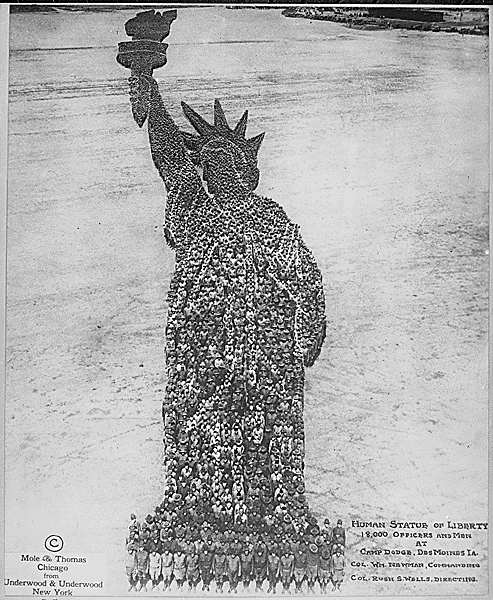 Three branches of the family immigrated to St. Louis, though others made their way to New Jersey, Canada, and Israel. I am indebted to a cousin for a large amount of research on the Cruvant families, and have assured her I will not share her research online. So while I have a good amount of information on the descendants of four of Moshe Leyb's five brothers, I will not be sharing it below. I also do not list relatives who I know are still living. 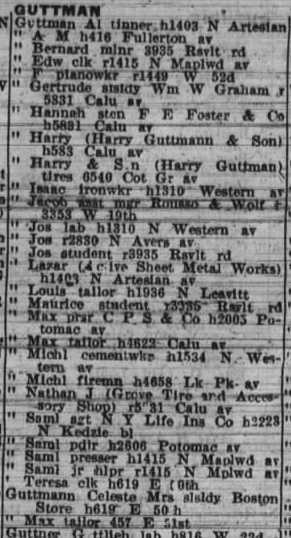 This week I look at the St. Louis City Directories from 1892 and 1893 for my second great grandfather Selig Dudelsack, who changed his surname to Feinstein shortly after arrival in America. Jasia needs more submissions for the 100th Carnival of Genealogy and another "One in Every Family" came to mind. There are more exceptions to this choice than the last, and at this time of year many churches, synagogues, schools, and fraternal organizations raise money and collect items for those families without. However, most families have a home. I've shared photographs of several homes on this blog in the past. 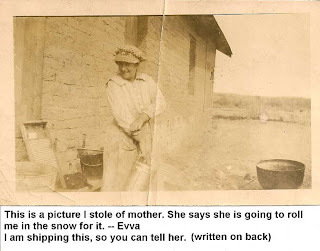 Below is my great grandmother, Margaret (Denyer) Van Every in front of, I believe, the family home in Fabens, Texas (outside of El Paso). 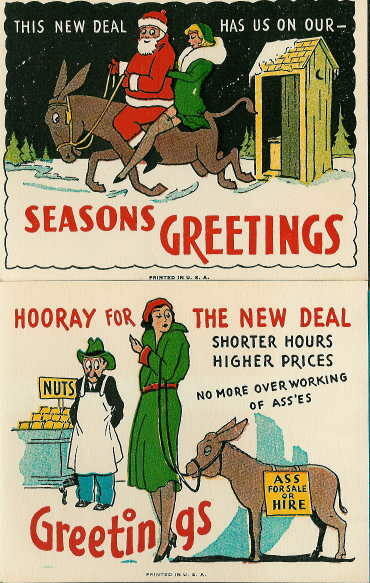 I'm fairly certain the year was between 1920-1923. 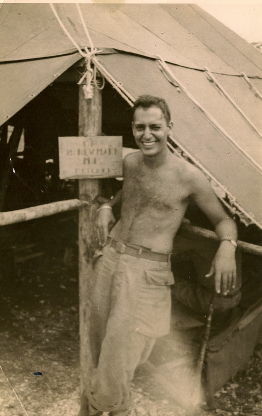 Below is my great uncle, Mandel Newmark, outside of his 'home' while serving during World War II. However, I know from the war diary he kept he didn't consider that home. Home was where he hoped to return, but never did. Below is Mandel's mother, Bertha (Cruvant) Newmark, looking out the window of what I assume is the family home. 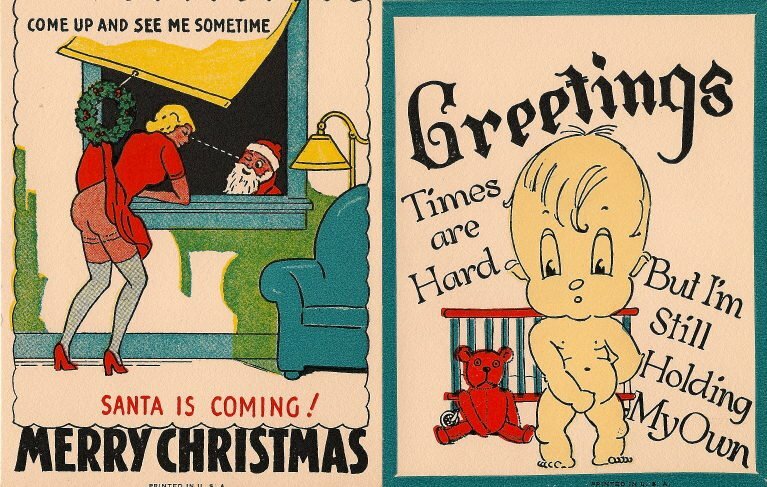 However, since I don't know the year, I don't know the address. "Home is the place where, when you have to go there, they have to take you in." -- Robert Frost wrote in "Death of a Hired Man"
Tess Slesinger wrote, "Home is where you hang your hat, and drop your skirt, my dear." (The Unpossessed, 1937) The proverbial "Home is where you hang your hat," may well date back further, but this is the earliest usage I have been able to find in an internet search. Which, seek through the world, is ne'er met with elsewhere. There 's no place like home! Hanuka begins at sundown tonight. It's an 8-day celebration starting on the 25th day of the first month of Winter on the Hebrew calendar, marking the Maccabean revolt in 166 BCE. There are more videos in my post last year at this time. This week my transcription is very short. An entry from a listing of real estate transactions from the St. Louis Post Dispatch in November of 1907. The origin of the surname is a bit unclear. There is a German bagpipe called a Dudelsack. However, the word 'Dudel' is a diminutive for "David" in Yiddish, so there's a strong possibility the surname is patronymic in origin. Spelling of the surname varies. Four Dudelsack siblings immigrated to America in the late 1800s. My great great grandfather Selig, a brother Yidel, a sister, Toba, and a sister Zlota. Toba had married Aaron Oberman prior to immigration. Selig and Yidel both changed their surnames upon arriving in America. Yidel Americanized his given name to Julius, Toba went with Tillie, and Zlota chose Lottie. Family lore says there were four siblings who remained in Russia. Nothing beyond their names are known. The numbering below follows the d'Aboville system. I've emboldened my direct ancestors. It's currently unclear what town in Russia the family originated. It was most likely in the region of Volhynia. 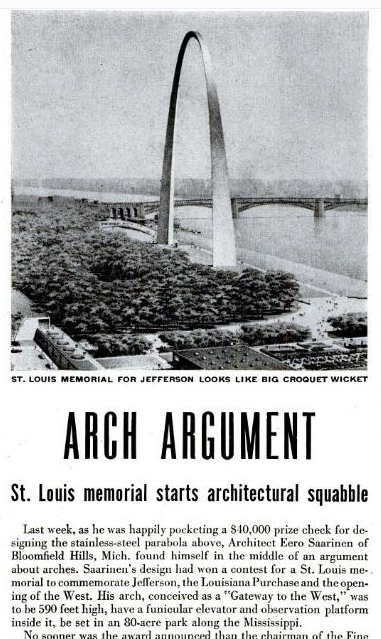 The four families started in America in St. Louis. Most of the Odelsons moved to Chicago, and the Goodmans moved to Tulsa. This week I transcribe a letter my maternal grandfather, Martin Deutsch, sent home Thanksgiving, 1942. "There's one in every family!" Bring your stories of colorful characters, unique heirlooms, mouth-watering recipes, most dearly beloved pets, whatever! Interpret as you like. I knew I wanted to participate in this Carnival of Genealogy family reunion, but I pondered on what I would choose to write about. I don't like discussing living relatives, and while there are a handful of ancestors I could discuss under the topic of blacksheep, I'd rather not. However, the theme wasn't limited to people. Jasia specifically suggested family heirlooms, recipes, and other objects. I've discussed a couple of heirlooms before, and could think of a few more, but the topic didn't appeal greatly to me at this time. So I pondered some more. Something or someone every family has. After a few weeks of sorting through the possibilities, a new idea came to me. Something almost every family indeed does have. Most European nations began requiring them in the 18th and 19th centuries. Most of my personal experience with surnames comes from Western European culture, though I know other cultures handle surnames differently. The origins of surnames are sometimes sorted into five categories, which I have listed below, and provided examples from my ancestors. I looked up surname origins at both Ancestry and the Surname Database. My paternal grandmother's original ancestral surname was Dudelczak. While the surname is possibly derived from the German bagpipe, Dudel is also Yiddish for "David." The odds are this surname was patronymic in origin. My surname, Newmark, likely is derived from the German/Polish area known as Newmarch. My paternal great grandmother's surname, Cruvant, came from the Lithuanian town, Kruvandai. 5) Ornamental Name - A name chosen by the family as an ornament. My paternal grandmother's surname, Feinstein, means "fine stone." Selig Dudelczak adopted the surname upon his arrival in America. My paternal great grandmother's surname "Blatt" is ornamental for most Jewish families, originating from the German and Yiddish word for "leaf." However, the non-Jewish German Blatt surname is considered to come from the German word "Blate" meaning a flat surface or plateau, and likely topographical. My maternal great great grandmother's surname "Adler" means "Eagle." * Select up to five keywords and we'll search both the deceased's name and the obituary text. * Search as many or as few newspapers as you like, and update your newspaper list at any time. * To streamline your results e-mail, we will now include four lines of text per obituary with a link to access the full obituary. * You will now be able to choose a secret question for account security. As a current subscriber, your secret question will default to your mother's maiden name. You will have the option to leave as-is or select a new question. Your current account information (including login, password, keywords and newspapers) will be carried over to the upgraded ObitMessengerTM service. In other words, no action is necessary on your part. You can visit your account here. If you have any questions, please contact us at obitmessenger@legacy.com. Legacy handles the obituaries for hundreds of newspapers across the US and Canada, so this is a great way to retrieve obituaries mentioning a particular surname regardless of what newspaper they happen to appear in. Previously, you could search for five surnames in every newspaper they managed, but it would only find an obituary if it was the surname of the deceased -- not if the surname appeared in the text as a relative, etc. And this cost $40/year. Since each 'account' is tied to an email address only, I have several email addresses, and the Terms of Service don't appear to prohibit setting up multiple accounts, it shouldn't be difficult to now set up a few different accounts with the names of all the major funeral homes in the area, and in this fashion get close to all of the obituaries emailed to me. I've also set up an account that searches for five of my more uncommon surnames across their network. I paid $15 a little over a month ago for a full year account. And now it's free. One other note: I do not use my mother's maiden name as a security passcode anywhere. I maintain a genealogy blog where anyone who wanted to could look it up. I'm not silly. UPDATE : The emails now contain adverts for flowers and genealogy services. I see nothing wrong with this. I am more than happy to see these daily adverts in place of an annual fee. Update 2: Legacy added a comment, and as they state, and I hadn't noticed, it is possible to create multiple searches on one email address, so multiple email addresses are no longer necessary. NBC has announced they're giving me a birthday present! Season 2 of Who Do You Think You Are is returning to the air on Fridays, starting on January 21, which just happens to be my birthday. It's so thoughtful of them. There's no word yet on who the celebrities will be. This week I transcribe the obituary of my great uncle, Harold Newmark. He was brother to my grandfather, Melvin Newmark. This is what Amanuensis Monday was created for. Amanuensis is an obscure word, but it derives from the Latin, ‘Manu’ meaning ‘hand’. I began this project back in February of 2009, and since then, many others have joined in on the meme. Why do we transcribe? If you have an Amanuensis Monday post on your blog, please feel free to add a link below. Deutsch is a common surname. The name, in German, means, "German." One might assume this suggests a family with this surname originated in Germany. That's not necessarily the case. There are two common pronunciations of the surname. There's the German fashion which sounds like Dyche or Ditch, and the Austrian fashion which sounds like Doytch. My grandfather pronounced it in the Austrian fashion, though there is evidence some of his cousins pronounced it in the German fashion. A lot of the information I have on the early generations below comes from family lore, passed down orally on an audiotape my grandfather and his siblings recorded in the 1970s, pieced together with documents I've found online. Since Deutsch is a common surname, the odds I have made some mistakes in the patchwork increase. I will make corrections/additions as they are discovered. The numbering follows the d'Aboville system. I've emboldened my direct ancestors. Since I'm less certain on geographical locations for many of the names, I've left them off this descent. 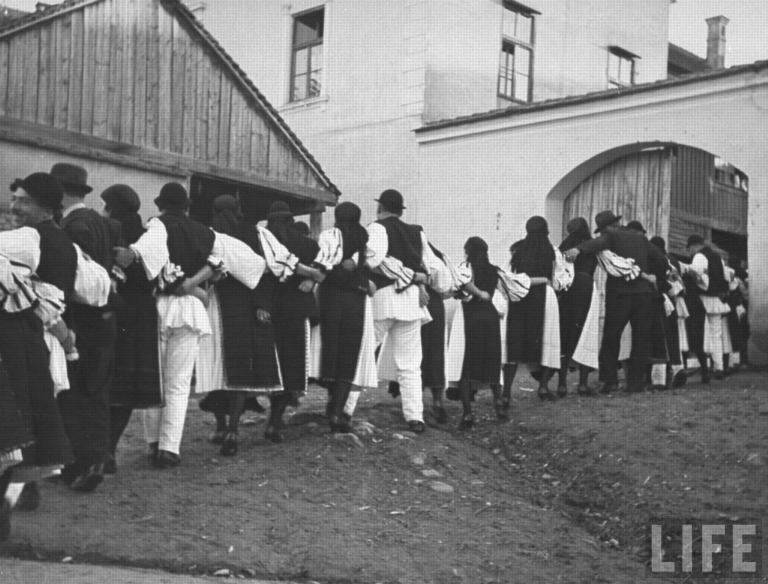 The family originated in Transylvania, and lived in several cities there including Turda, and Varalmas. 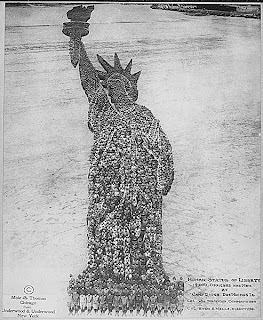 Many of the branches that immigrated to America settled originally in Chicago, Illinois. Possibly jumping the gun on this one by a couple weeks, but I thought I'd get in the spirit, and it's been awhile since I did a "Friday Five." In honor of Veterans Day/Remembrance Day, below are the names of ancestors, and their siblings, who I know served their nation's military, either in a time of war, or in a time of peace. Several have been added to the list from last year. 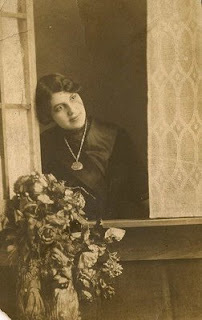 This week I transcribe the obituary of Dora (Goldstein) Cruvant. Her husband, Ben Cruvant, was the brother of my great grandmother, Bertha (Cruvant) Newmark. Another weekly genealogy meme? I've been thinking about participating in this one for awhile, and the initial post below has been ready to go for several months, as I awaited some further information. I stopped waiting. To participate in Surname Saturday, simply create a post in which you discuss a surname and mention its origins, its geographical location(s) and how it fits into your genealogy research. I'll start with the most obvious surname to begin with - my own. From my research it appears there are a handful of "Newmark Clans" in the United States that originated in either the Neumark/NewMarch region of Germany, or near enough in Poland to raise the question of where those Polish ancestors actually came from. (The clan to which I belong being part of the latter.) These clans also seem to often share something else besides geographical origin - a Jewish religious background. Whether or not we are all related would likely require a Y-Surname DNA study, but it wouldn't be surprising to learn that at least some of us are. It's doubtful though we'll ever be able to trace the exact lineal connections. The first known progenitor of the Clan from which I descend is Israel David Newmark. Below is a limited descendant chart utilizing the D'Aboville numbering system, including the locations the individuals lived, and their birth, marriage and death dates. I could extend it further, but I can't do a complete list of the next generation without deciding which information to leave out for living relatives. I wonder if my British Denyer ancestors, who immigrated to America in the early-1800s, observed Guy Fawkes day in any fashion after arriving in America. I wonder if my Newmark ancestors who lived in London for fifteen years from the mid-1890s to 1910 got into the habit of celebrating it with their neighbors. This post has nothing to do with genealogy. A lot to do with blogging, and socializing on the internet. (And off the internet.) Some people will see perhaps connections to other blog posts elsewhere. However, I am making this post generic so that I can direct people in the future to this post, and say, "Read this - these are my thoughts." They will apply today; They will apply in the future. This way I don't have to retype them. If you think these thoughts match yours in a future instance, feel free to direct people here as well. I first started participating in internet discussions in college back in 1988, when the internet was still called "Bitnet." I particularly enjoyed the political discussions, so I am well used to the heated arguments that tend to develop. I'm also still amazed at how often people resort to insults and name-calling. 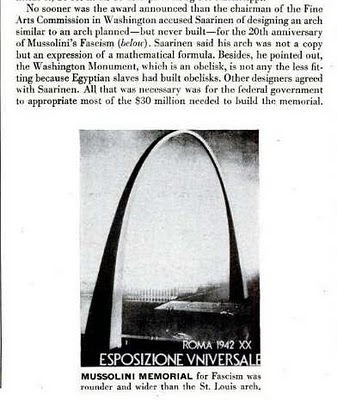 The ad hominem attack isn't new. We see it a lot on what passes for television commentary today, but poet, Jonathan Swift (1667-1745), was a master at the ad hominem. (Two poems about a politician named Richard Tighe, with whom Swift disagreed.) Still, it may be old, but it's not a very useful type of argument. 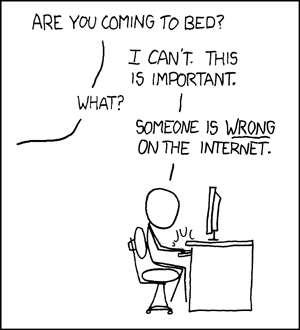 It only serves to make the individual you're arguing with either angry at you, or depressed about themselves, or both. There's a poem, Incident, by Countee Cullen (1903-1946) that makes this point well. About 12 years ago I read a book that made an incredible impression on me. "Words that Hurt, Words that Heal" by Rabbi Joseph Telushkin. He talks about the power of words, mixing religious quotes, with anecdotes from the newspaper and history. He covers a lot of ground from malicious (and non-malicious) gossip to criticism to public humiliation. He also discusses how to use the power of words for good. It should be noted that Telushkin admits he struggles with it at times. I do, too. All of humanity does. But the point is to struggle with it, and reduce the hurt we cause from our words. 1. How do I feel about offering this criticism? Does it give me pleasure or pain? If part of you is looking forward to it, hold back. Your motives are probably at least partly insincere (you don’t so much wish to help this person as relish cutting him down to size) and your listener will probably respond defensively and reject your critique. If the thought of critiquing another pains you, yet you feel impelled to speak up, do so. Your motives are probably sincere; your concern for the other person will shine through, making it likely that he or she will be able to accept, or at least hear, your criticism. 2. Does my criticism offer specific ways to change? 3. Are my words non-threatening and reassuring? 1. Administer the rebuke in private. 3. Point out that he is only speaking for the wrongdoer’s own good. with several discussions on how religious rites have impacted our family histories. And not only has the theme for the 100th edition has been announced, CreativeGene has declared she wants at least 100 submissions from at least 100 past participants in the CoG. "There's one in every family!" Bring your stories of colorful characters, unique heirlooms, mouth-watering recipes, most dearly beloved pets, whatever! Interpret as you like. Every family has "special" individuals, you know, the ones with a green thumb, the black sheep, the lone wolf, the blue-ribbon cook, the story-teller, the geek! I know you have treasured recipes and amazing heirlooms you've yet to share! Tell us about them and become a part of history in the 100th edition of the Carnival of Genealogy! The deadline for submissions is December 1st. Schrödinger knows a thing or two about elections. Schrödinger the Cat's Election Theorem: You can’t know whether your candidate has won or lost until the votes are counted. Until that moment, your candidate is half a winner, and half a loser. Religious Rites: Organized religion played a large part in many of our family histories. Virtually all religions have their rites/ceremonies. Has your family participated in any of these rites? Weddings are perhaps the most joyous of all religious rites. If my recollections are correct, across four decades I have attended twelve, including seven involving family members. I have had a role in several of them - I've read from a prayer book, been a chuppa (canopy) pole holder, witnessed a Ketubah (marriage contract), and was a groomsman more than once. The wedding location has usually been at a church or synagogue, but two have been held outdoors. All twelve of the ceremonies reflected the religious beliefs of the bride and groom in some fashion. As it is I suspect with most. Perhaps, sometimes the ceremony reflects more the religious beliefs of the parents. When there are differences, some will bow to the dictates of family harmony. Most of my European Jewish immigrant ancestors were Orthodox in their faith, but their children moved towards Reform in the early 20th century. For example, I know that my great grandparents Herman and Annie (Blatt) Feinstein were married by the Chief Orthodox Rabbi of St. Louis, but they raised their children at United Hebrew Temple, a Reform congregation. My other paternal great grandparents, Barney and Bertha (Cruvant) Newmark raised their children in the Reform tradition as well, at B'nai El. I haven't located their marriage certificate yet. (I believe they were married in East St. Louis) However, I know the Cruvants were Orthodox, and I also know where Barney's older brother, Sol was married. In the post I wrote three years ago I researched every name and other piece of information I could find on the certificate. I won't detail everything I learned -- you can read the original post. The scores of Hast's compositions are available for download, and there is a section devoted to wedding music, so the music that was likely played at the ceremony could be duplicated. I provided the link, but the scores are in the public domain, so here they are for two traditional songs welcoming the bride and groom underneath the chuppa. He who is mighty above all, He who is blessed above all, He who is great above all, He who is distingui​shed above all, may He bless the groom and the bride. Find a poem by a local poet, famous or obscure, from the region one of your ancestors lived in. It can be about an historical event, a legend, a person, or even about some place (like a river)or a local animal. Or if you prefer, post the lyrics of a song or a link to a video of someone performing the song. 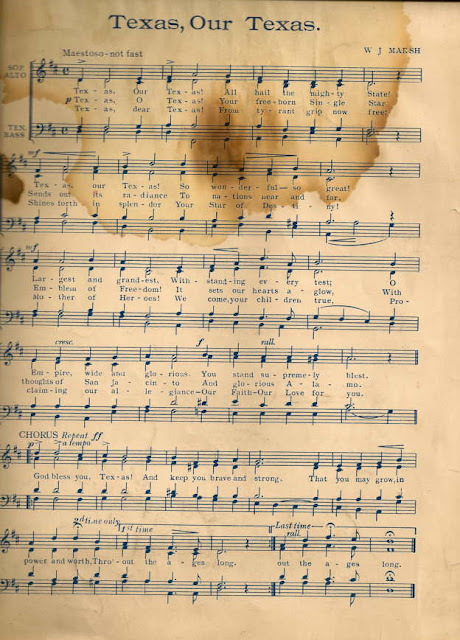 Tell us how the subject of the poem or song relates to your ancestor's home or life. 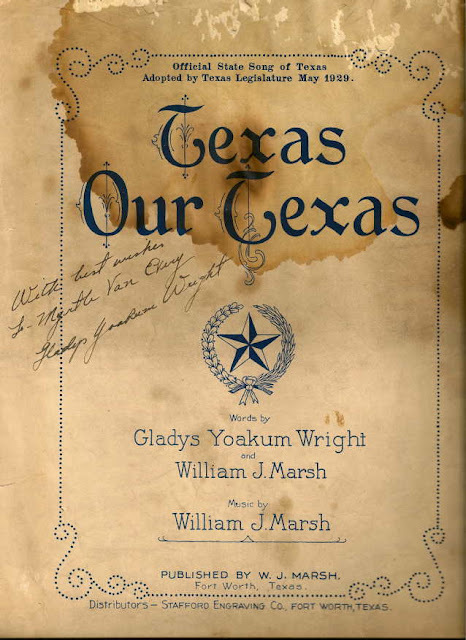 While she was no longer living in Texas, I have some evidence a place for her home state remained in my grandmother's heart: A copy of the sheet music, autographed by Gladys Yoakum Wright. The original lyrics to the song were slightly different from what they are today. When Alaska was added to the Union, they changed the word 'largest' to 'boldest' in the first verse.